Cal-Mil 1135-12-13 Black One by One Ice Housing with Clear Pan - 23 1/2" x 15 3/4" x 7 1/4"
Perfect for ingredient storage and a wide range of other food prep tasks, this full size 2 1/2" deep clear polycarbonate food pan offers a valuable addition to your kitchen. Designed to last even in the toughest commercial kitchens, this food pan is made with shatter-resistant polycarbonate material that resists scratches, dents, and clouding up for long-lasting use. It also naturally resists food acids and oils to maintain crystal clarity, making it easy to clean and maintain. Plus, its clear design enables you to easily see its contents, allowing you to easily store and identify your foods during prep. Whether using it to hold fresh fruits, bulk sides, lettuce, or meats, you can rest assured that it will withstand the abuse of daily use. Extremely versatile in application, this pan's size and rounded off corners ensures a smooth fit in your refrigerated prep tables or salad bars in addition to storage. Graduated markings on the exterior of the pan ensure efficient estimating for product counts, thus promoting easy inventory management. It can withstand temperatures of -40 to 210 degrees Fahrenheit for various storage locations, giving you and your staff flexibility in storage, transport, and use. 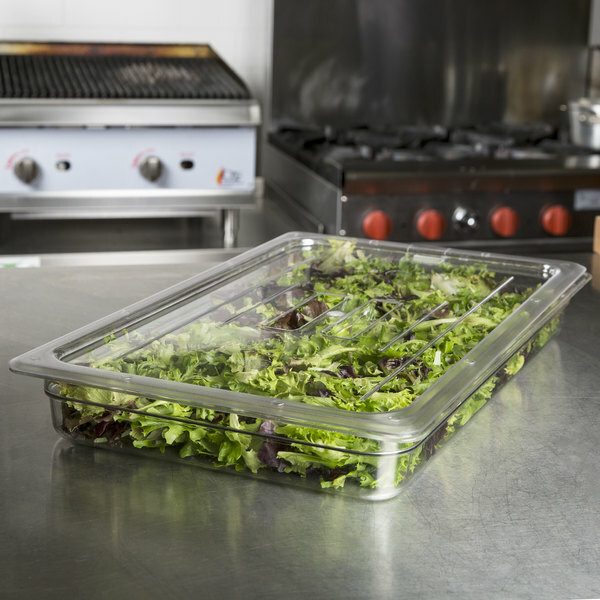 Boost efficiency while also increasing food safety in your establishment with this polycarbonate food pan! 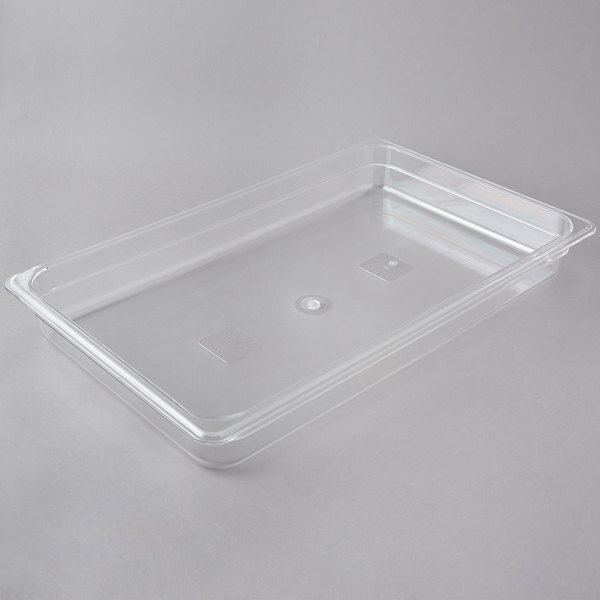 Top: 20 3/4" x 12 3/4"
Bottom: 19" x 11 3/4"
These full size clear food pans are made very strong and durable. We love using these pans to store our prepped fruits inside of. Great price. I use these bins and the corresponding lids to freeze pastries. They are a good size and stack well; you can fit 4-5 in a regular home freezer. We use these with some homemade dividers to transport french macarons. They are sturdy and easy to clean. We've used them for about a year and have had no issues with cracking or chipping at all. These clear pans are ideal for storing and transporting my mini cupcakes and other small desserts. I can put several dozen, single layer with frosting and they clear the lid just fine. This size fits perfectly inside the 4" Deep Clear Pan, which is a space saver for refrigeration and transporting. Nice durable product that does exactly what I need it to do. Again, can't find a better value online. I order quite a few things from here and have only had a few things I was unpleased with. Love, love, love these pans. They will definitely spruce up your cold bar and give it a very professional appearance. Highly recommended for any occasion! great pay for putting all the sliced steak in one pan, and save a lot of space that you can stack them up easily! great! I honestly haven't seen any difference between these and other brands of this type of pan (cambro, carlisle, etc.). they are very sturdy and lightweight and this "no name" is a much cheaper option. These are a great value over the name brand food pans. I use these to transport my small pies to farmers markets, and they take a lot of abuse. Excellent 2.5-inch deep polycarbonate food pan. 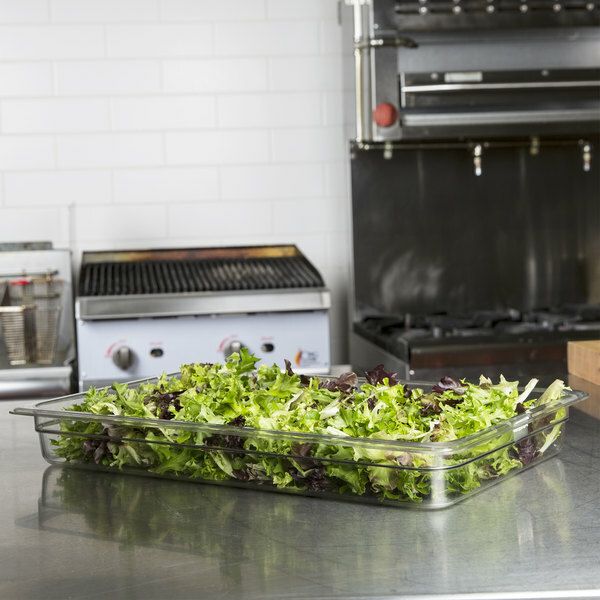 This polycarbonate food pan is shattered resist They are easy to clean and dishwasher safe. These pans can withstand a large range of temps. They don't scratch or cloud up. Our catering company has purchased several of these over the years. Great quality, they clean up really well. We love all the different sizes, we use them for everything, especially refrigerator items, and use for a quick riser on the buffet under our linens. Pan lid fits great on yet another awesome product. 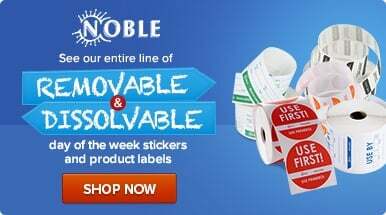 Love this website much cheaper than any where else. Will be ordering more soon. We use these food containers in our freezers, refrigerators as well as in our dry storage areas. They work great in every application we have used them for. I've been looking for a solution for storing dough balls on my food truck. We have very limited space and these are it. I can get 11-8.25oz balls in each one and have more than tripled the amount of prepped dough we can store in the fridge. They are very sturdy and easy to clean. Tip: If using for dough balls or something similar, get the lid without the handles. Great for holding cold foods at temperature. I placed this on my salad bar and it held my cocktail shrimp cold for the entire service.